One thing I like about this second method is that it lets me pick out the changes to separate out in an editor with full context. I think this is a lot better than git add -p, which involves editing the hunks directly, and sometimes provides too little context to let me determine if a particular hunk should be separated out or not. Over the last few months, I've been working on an improved App Not Responding (ANR) dashboard for Fennec, which is now hosted at telemetry.mozilla.org/hang/anr. With the help of many people, I'm glad to say that the dashboard is now mature enough to be a useful tool for Fennec developers. The ANR Reporter is enabled on Nightly and Aurora builds only, and if the user has not opted out of telemetry, the collected information is sent back to Mozilla, where the data are aggregated and presented through the ANR Dashboard. Because the debug logs may contain private information, they are not processed and are only available internally, within Mozilla. The ANR Dashboard presents weekly aggregated data collected through the ANR reporter. Use the drop-down list at the top of the page to choose a week to display. Data for each week are then grouped by certain parameters from ANR reports. 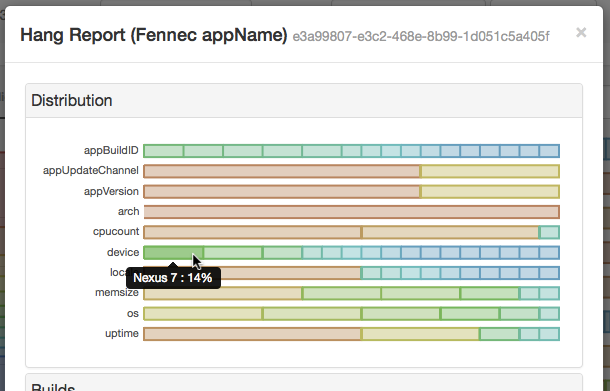 The default grouping is “appName”, and because ANR reports are specific to Fennec, you only see one column in the top hangs chart labeled “Fennec”. However, if you choose to group by, for example, “memsize”, you will see many columns in the chart, with each column representing a different device memory size seen from ANR reports. Each column in the top hangs chart shows the number of hangs, and each column is further divided into blocks, each representing a different hang. Hover over the blocks to see the hang stack and the number of hangs. 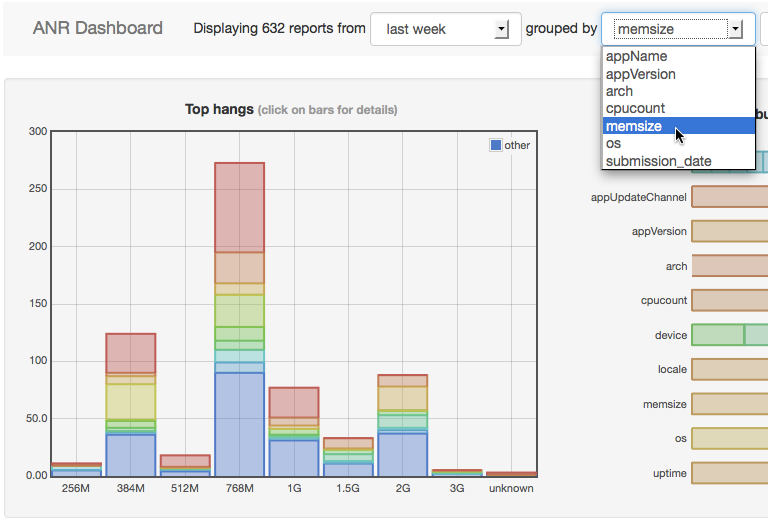 This example shows 8 hangs with that signature occurred on devices with 768MB of memory over the past week. Colors are preserved across columns, so the same colored blocks all represent the same hang. The blue blocks at the bottom represent all hangs outside of the top 10 list. To the right of the top hangs chart is the distributions chart. It shows how different parameters are distributed for all hangs. Hover over each block to see details. This example shows 36% of all hangs occurred on devices running Android API level 15 (corresponding to Android 4.0.3-4.0.4 Ice Cream Sandwich) over the past week. The distributions chart can also be narrowed down to specific groups. This would let us find out, for example, on devices having 1GB of memory, what is the percentage of hangs occurring on the Nightly update channel. Clicking on a block in the top hangs chart bring up a Hang Report. The hang report is specific to the column that you clicked on. For example, if you are grouping by “memsize”, clicking on a hang in the “1G” column will give you one hang report and clicking on the same hang in the “2G” column will give you a different hang report. Switch grouping to “appName” if you want to ignore groups — in that case there is only one column, “Fennec”. The hang report also contains a distributions chart specific to the hang. 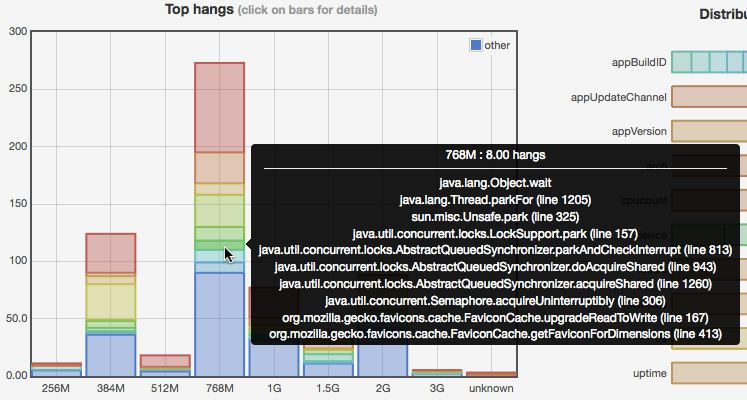 The example above shows that 14% of this hang occurred on Nexus 7 devices. In addition, the hang report contains a builds chart that shows the frequency of occurrence for different builds. This example shows there was one hang from build 20140224030203 on the 30.0a1 branch over the past week. The chart can be very useful when verifying that a hang has been fixed in newer builds. Last but not least, the hang report contains stacks from the hang. The stacks in the hang report are more detailed than the stack shown on the main page. You can also look at stacks from other threads — useful for finding deadlocks! When comparing the volume of hangs, a higher number can mean two things — the side with higher number is more likely to hang, or the side with higher number has more usage. For example, if we are comparing hangs between devices A and B, and A has a higher number of hangs. It is possible that A is more prone to hanging; however, it is also possible that A simply has more users and therefore more chances for hangs to occur. To provide better comparisons, the ANR Dashboard has a normalization feature that tries to account for usage. Once “Normalize” is enabled at the top of the dashboard, all hang numbers in the dashboard will be divided by usage as measured by reported uptime. 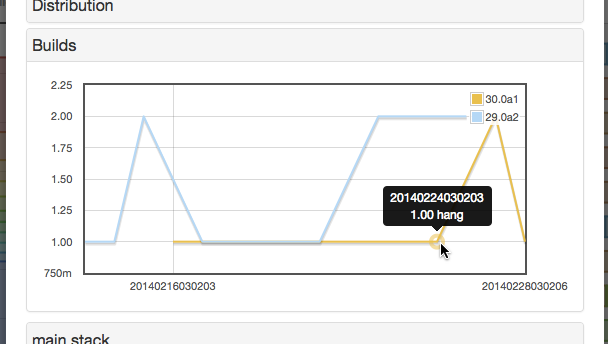 Instead of displaying the raw number of hangs, the top hangs chart will display the number of hangs per one thousand user-hours. For example, 10 hangs per 1k user-hour means, on average, 1000 users each using Fennec for one hour will experience 10 hangs combined; or equivalently, one user using Fennec for 1000 hours will experience 10 hangs total. The distributions chart is also updated to reflect usage. As a demonstration, the image below shows un-normalized hangs grouped by device memory size. There is no clear trend among the different values. The image below shows normalized hangs based on the same data. In this case, it is clear that, once usage is accounted for, higher device memory size generally corresponds to lower number of hangs. Note that the “unknown” column became hidden because there is not enough usage data for devices with “unknown” memory size. At the moment, I think uptime is the best available measurement for usage. Hopefully there will be a better metric in the future to provide more accurate results. Or let me know if it already exists! The standard library function setvbuf() can be used to set unbuffered mode for a stream. However, fread() on Android has the behavior that, in unbuffered mode, it can sometimes return EOF, or (size_t)(−1), instead of the number of elements actually read. This unexpected behavior was the cause for bug 935831. I took a glance at the few other places where Gecko uses unbuffered mode, and fortunately, it appears none of them apply to a regular Android run. 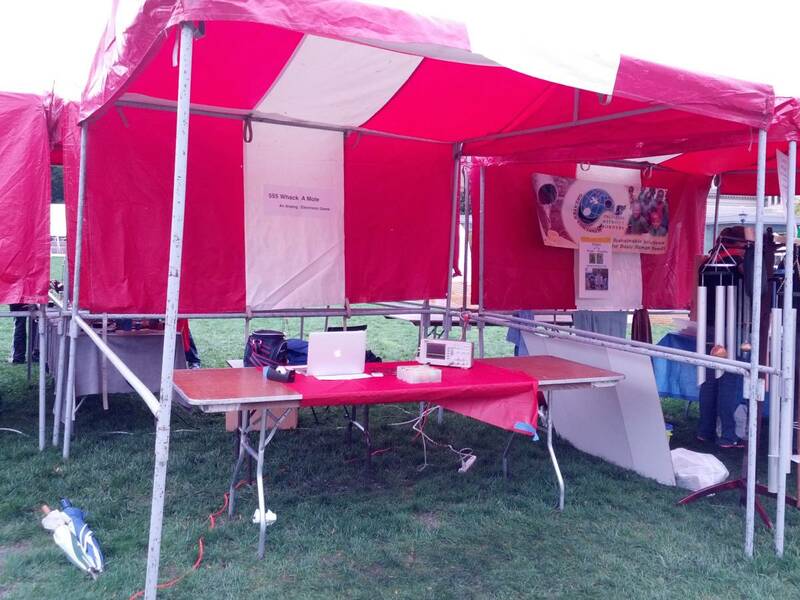 This past Saturday I had a great time presenting my project at the Cincinnati Maker Faire. I redesigned my 555 Whack-a-Mole game from two years ago, adding a laser-cut acrylic case, and held a high-score contest in my little booth. It was a cold day and it rained for most of the morning and into the afternoon, but that did not prevent lots of people from coming to the fair. The most satisfying thing for me was the enthusiastic responses, especially from the kids there. Quite a few kids came back to the booth to play the game again after they left. A few of them even said they wanted to make a game just like that, which really showcased one of the main purposes of the Maker Faire – promoting interest in science and engineering. It was truly fantastic for a first-time event, and now I have another project in mind for next year's Maker Faire. Stay tuned! The Android GDB (JimDB) Wiki and pre-built binaries now include instructions and support for Android on x86. Not only is it useful on the growing number of x86 devices, it is also useful on the x86 emulator included in the Android SDK (for developers without access to a device). Presently, the x86 version is entirely separate form the ARM version - you would need both versions in different directories if you have devices on both platforms. The updated GDB also has limited support for on-demand decompression on Android. If you've been noticing random seg faults when debugging Fennec, the new version will ignore these seg faults. 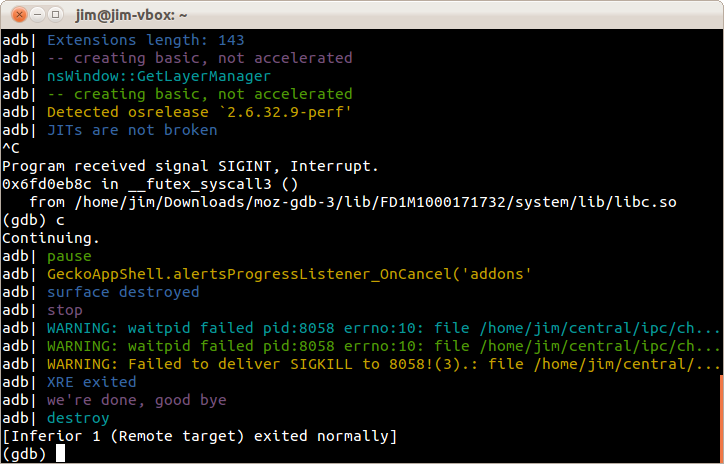 See "Random segmentation faults when debugging Fennec" and "monitor set ignore-ondemand" in the Wiki for more information. Next up, I will be working on offering a B2G version of JimDB with similar functionality and benefits as the Android version. See the dev.b2g posting for the discussion. Let me know what you think! At the mobile team meet-up two weeks ago I demonstrated some of the newer features in JimDB, the GDB package used for Fennec development. This past week I pushed out these new changes, and also updated the wiki page, which includes (or will include) all instructions and documentation. You should check it out if you ever need to use GDB to debug Fennec! Pre-built archives and instructions, for both Linux and OS X, and both 32-bit and 64-bit. Because XRE is needed for running Mochitests, JimDB can automatically download and manage a copy of XRE for you. Experimental Java debugger (JDB) integration. Now you can choose the “Debug using jdb” option to debug Fennec Java code (see the jdb doc page for a quick JDB tutorial; so far at least the print and stop commands work). Or you can launch two JimDB instances to debug C++ and Java simultaneously. With these improvements, give the new JimDB a try! Let me know if you run into issues. You can always find me as jchen in #mobile on IRC. There is also a JimDB component on Bugzilla under Firefox for Android. Let me know if any of these features would help you! 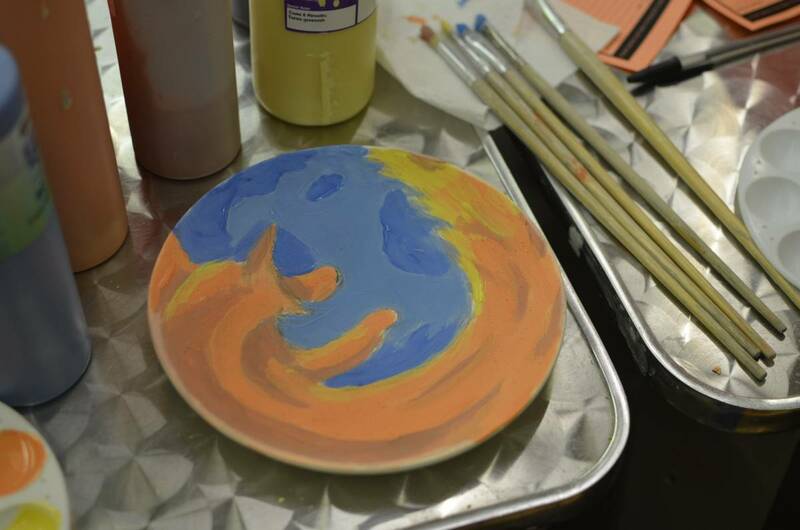 Went out to a ceramics studio tonight, and I painted a Firefox logo plate! It will take a few more days for it to fire (no pun intended), so I'll have to wait to see how it turns out. Overall a fun night with friends and I highly recommend you visiting one if there's a studio near you! With help from Dan Mosedale (dmose), JimDB now has the ability to debug C++ unit tests running on your Android device . To get started, first update your JimDB Python scripts by running git pull under the utils directory. Then after choosing the object directory, the actual test is specified along with any environmental variables and arguments. Environmental variables can also be preset in the gdbinit file in the utils directory. Ready. Use "continue" to start execution. out> ### Test  1: will a |nsCOMPtr| call |AddRef| on a pointer assigned into it? Support is limited to C++ unit tests for now, but the plan is to include more types of tests that you can debug (mochitest, reftests, etc.). Stay tuned! Feel free to ping me (jchen) on IRC #mobile if you have questions, or file bugs under the Firefox for Android > JimDB component on Bugzilla. In my current workflow, I use a MacBook Air to ssh to a Linux machine for developing and building Fennec (mostly because the Linux box has a way beefier CPU for building than the 2-core MacBook; also it saves battery when I'm not plugged in). But since everything is on the Linux box, I needed a way to make ADB talk to my phone which is connected to my MacBook. Also, the two machines should have the same version of adb. This snippet sets the ADB client port to 5038 only when you are ssh'd in. That way, ADB over SSH will use one port, and ADB used locally will use another port. If you pull the latest gdbutils for JimDB, you can uncomment the following line in utils/gdbinit to use this port for gdbserver. Edit: Thanks kats for pointing out an unclear part about which .ssh/config file to edit, and that you need the same version of adb. 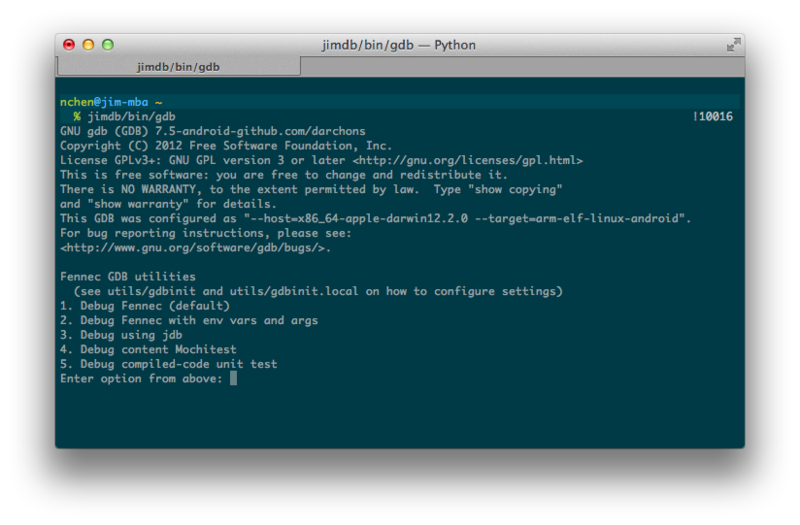 I took some time today to update both the Fennec Android gdb (aka 'jimdb') and gdbutils. Build instructions should be the same. You can also grab the pre-built Linux tarball. Note that the pre-built binaries require libpython2.7. feninit automatically sets up the debug environment. The updated version adds support for B2G (see gdbinit for details; thanks ThinkerYzu!) and various bug fixes. 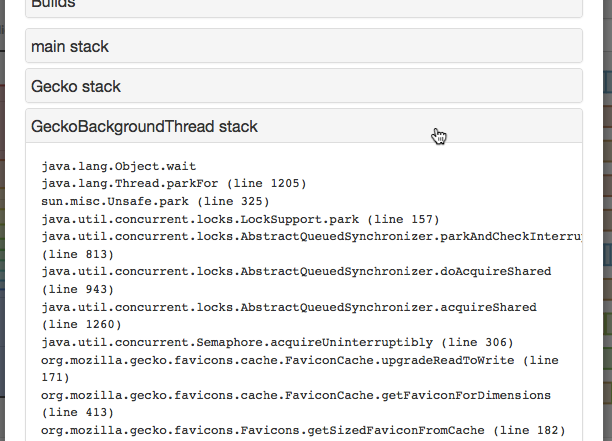 tracebt is a stack unwinder that works by tracing assembly. The updated version adds a sanity check to stop unwinding before the script gets stuck somewhere and becomes depressed. fastload is a new module that automatically pulls system libraries from the device in the background. This way you don't have to wait minutes just to download system libraries when debugging on a new device. You can find additional documentation for gdbutils in the README. Feel free to ping me on IRC (jchen) or file issues on github! Thanks!